This is not a rant. Nor another exposition on going off the deep end and finding my way back (or up out of the depression hole). It’s also not about The Yellow Wallpaper, an incredible short story by Charlotte Perkins Gillman that you should read if you haven’t. This post is about my recent dye experiment with some madder root (Rubia tinctorum) that I got from Earth Guild‘s booth at Maryland Sheep and Wool (MDSW) all the way back in May. The weekend before MDSW, I had finished taking a dye class at the Art League of Alexandria with Steph & Alana and while we had talked about madder, we hadn’t dyed with it. I didn’t even have a dye book and had just started keeping up with online natural dye groups. In the Earth Guild booth, I picked up things I knew I’d need: their Natural Dyes starter kit, which includes basic mordants and Rita Adrosko’s Natural Dyes and Home Dying, some dyes that sounded familiar (madder root and cutch extract) just in case my plans for using plant material in my yard didn’t work out. 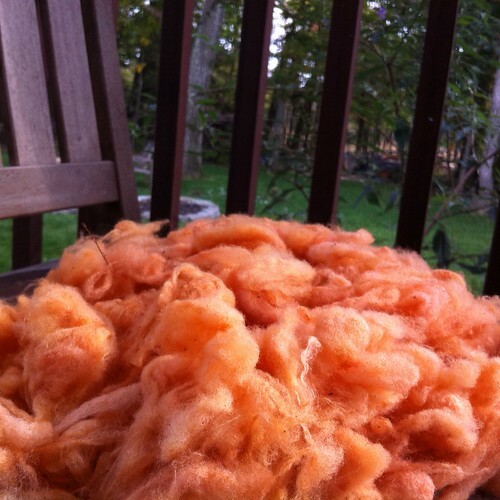 After SVFF at the end of September, where I bought 4 fleeces, I decided I needed to process the fiber I already had from the previous spring, when Jenni talked me into splitting 4 fleeces from Willow Hawk Farm. Talking me into more fleece really didn’t take too much effort since I had already decided to buy a fleece and splitting 4 instead of having one meant more breeds to experiment with and learn about. Anyway – Steph and I had already mordanted some of that fleece, Elizabeth’s fleece (she’s a white merino), with alum, so I decided to use that for my madder experiment. I checked a lot of places for directions and recipes before I got started. I do this with baking too in the hopes that I will have better results and less trial & error. Rita (Adrosko in Natural Dyes and Home Dying) lists several recipes, 2 close to the color I was hoping to get (laquer red), one with a 2:1 wool:dyestuffs ratio, the other at 1:1. Jenny Dean, in Wild Color, recommends a 1:1 ratio but cautions against raising the dye bath temperature too high since that will dull the reds toward a brown range. I turned to Ravelry next; several discussions in the two natural dye groups recommended keeping the temperature of the dye bath below 150° and adding calcium. While that was cooking, I prepped more fiber, this time fiber Steph and I pre-mordanted with alum. I’d gotten so much VM (vegetable matter – bits of grass and sticks and burrs) and second cuts (the sheerer goes back & cuts more off the sheep after already sheering some off) out of the wool I’d prepped the day before that I realized pre-prepping the wool was well-worth it so I wouldn’t waste any natural dye material on, well, natural material that was going to get tossed anyway. 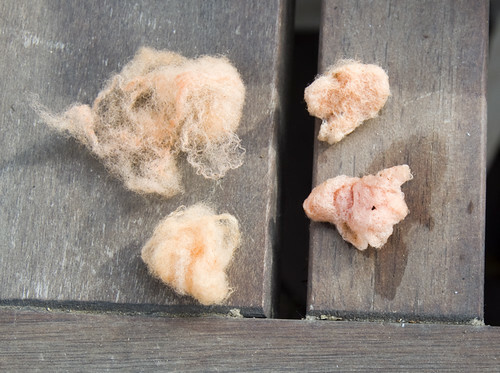 I also can’t just take clean fleece and pop it onto the drum carder and expect a lovely batt to come off of it; the fiber has to be teased out and layered onto the carder in conservatively thin layers or else you’ll end up with nupps/pills and patches of uneven, wonky fiber. 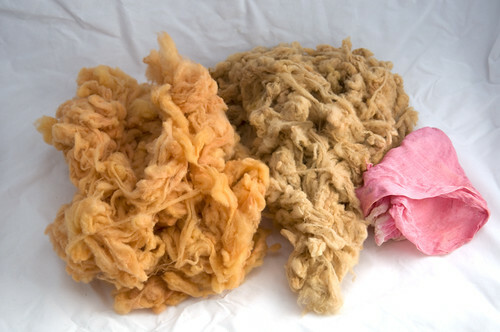 Left to right: unmordanted merino + madder, alum-mordanted merino + madder & safflower, cotton cheesecloth. 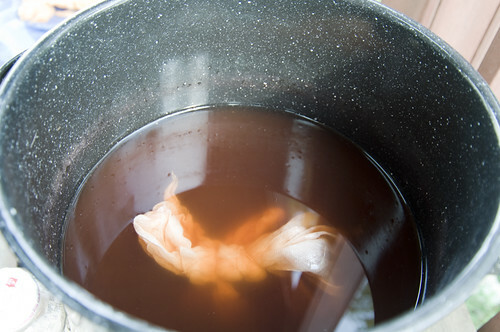 When I added the safflower, the cheesecloth immediately began sucking up the pink colors. I had really high hopes that the wool would as well, but alas. I think these orange colors will blend well with the yellows that I got from the butterfly bush; I just need to do some carding and see what I come up with. I still have the madder roots. On Monday I had the dye blender out (an extra regular blender that will now only be used for inedible stuff) to pulverize some bittersweet berries (a member of the nightshade family & poisonous, use with caution) and decided to blend up a madder smoothie (for dying, not drinking) also. There’s definitely more pigment in the roots; the water went from a murky peach to a deep reddish brown. I also still have the avocado peels from earlier in the summer and have been thinking about making a combined dye-bath. I confess I’ve also been thinking about using Jacquard Acid Dyes. It would be nice to know, with a lot more certainty, what color I’m going to get. But that will come with time and practice, right? Using acid dyes won’t really be so much of a chemistry experiment either, just a color experiment. Making decisions is agonizing. I think I just need to focus on working with the supplies I’ve got; I didn’t really set out to become an indy dyer, just to see what I can do with what’s available to me. And though the madder & safflower (and the cutch) technically weren’t readily available to me, at least they were natural/close to their original form and not synthesized in a lab. It looks like you are having a lot of fun experimenting! Were the original madder roots whole? 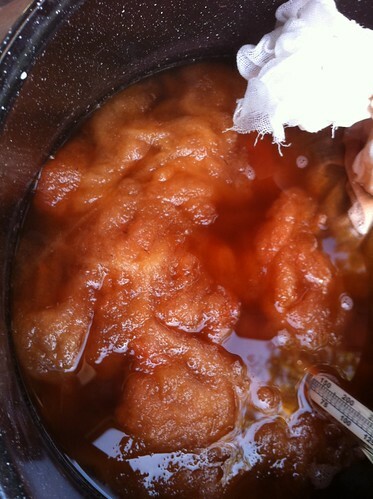 I'd thin you'd be able to extract a lot more dye from crushed or, as in your second experiment, ground root. Either way, that's pretty awesome. @MikeI am! But I'm also realizing that dying a large quantity of fiber this way isn't the most time-efficient way to go. 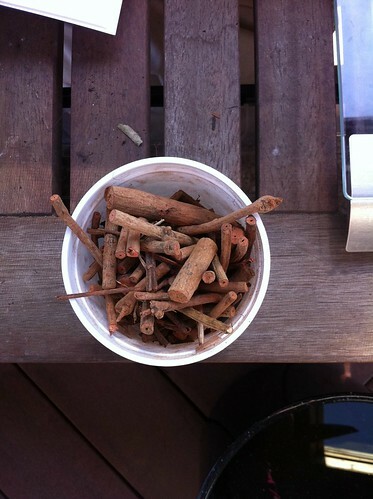 @Chris RYup – original roots were whole(ish) (I did include a picture). Smaller bits/madder smoothie should result in a lot more color. Though I'm thinking about combining it with lichen & maybe some of the avocado leftovers.